Jerry Tello is an internationally recognized authority in family strengthening, therapeutic healing, cross cultural issues and motivational speaking. 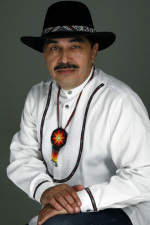 As a noted therapist, author, performer and program developer, over the last 30 years Mr Tello has incorporated his real life experience, together with research based knowledge and indigenous cultural based teachings to engage all in a reality-based healing and growth-inspiring experience. He is the author of children's books, professional publications, culturally based curriculums and inspirational CD's and DVD's. Mr Tello has received numerous awards including the Ambassador of Peace award and Presidential Crime Victims Service award.